Deidre's Discoveries: Macee Leigh Haul! I mentioned in my last post that I had a Macee Leigh haul to post. If you've never heard of Macee Leigh, it's an online shop. They sell tons of products such as make up, skin care, jewellery, clothes. It's pretty much a one stop shop. It is a direct sales company so there are consultants that sell the products - but everything is done online. I've met a few people through direct sales groups, and a few of them actually sold Macee Leigh. I had seen them posting about a few of the products and there were a few that stood out to me that I really wanted to try. Unfortunately, Macee Leigh decided to stop all orders going to Canada. They told their consultants they weren't allowed to sell to Canadians, and if they were a Canadian consultant, that they couldn't sell any more period. This made me unhappy because it affected some of my online friends, AND I couldn't try what I really wanted. There was a product named Reveal that was supposed to be a gel/moisturizer with little beads that you "poke" and apply the product on your skin. At the time I wanted it, it was sold out. The day it was brought back, was the day they found out Canadians could no longer sell. Boourns. One of my friends did have a bunch of stock (of other items) that she wanted to sell or else she would get stuck with them. So she sold them at a discount. This is how I got to try a few products. Fiber Lashes - these are supposed to be very similar to the Younique 3D Fiber Lashes... so a comparison review is definitely needed! 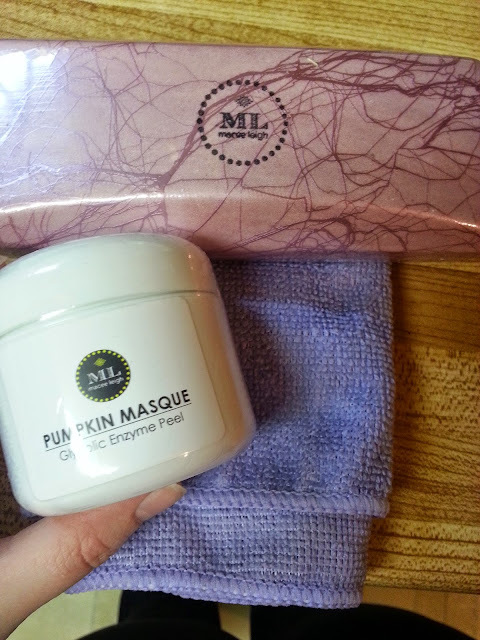 Pumpkin Masque - this masque is supposed to reduce redness and smooth your skin. It also smells like pumpkin pie which is pretty delicious to me! Face lift - that purple cloth there is supposed to be like a makeup eraser. If you've never heard of it, it's pretty much a cloth that has some makeup removing properties. All you do is run it under water, squeeze it out, and wipe your face with the cloth. One side has a bit of exfoliation. I've been using this every day, so a review will be up soon! I didn't want to review anything on this post, just so I could get some newer posts separated! Check back soon on my Macee Leigh experience!